For the first time in Orange County, son jarocho & hip-hop on one stage! July 29, Friday! 29 de Julio, el viernes! For the first time in Orange County, son jarocho & hip-hop on one stage! Musica de resistencia, comin' atcha! 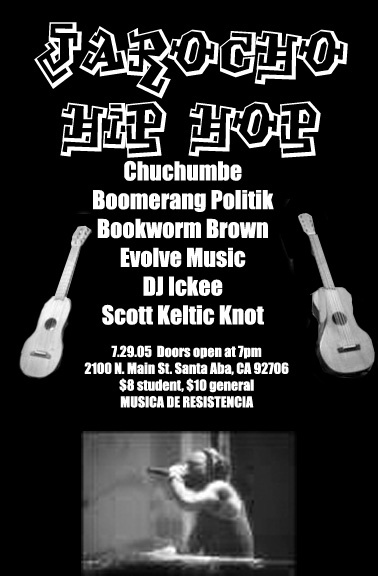 For the first time in Orange County, world-class son jarocho artists Chuchumb� shares the stage with hip hop artists! One night only in Santa Ana, California - DON�T MISS IT!!! Bring your talent - there will be a mic to freestyle. Doors open at 7pm. Student/estudiante $8 donation, General $10 donation. Chuchumb� has seven musicians dedicated to teaching and spreading the word about fandango (an audience participation combination dance and jam session taking place at night) through workshops of traditional music, dancing, poetry, and instrument-making. 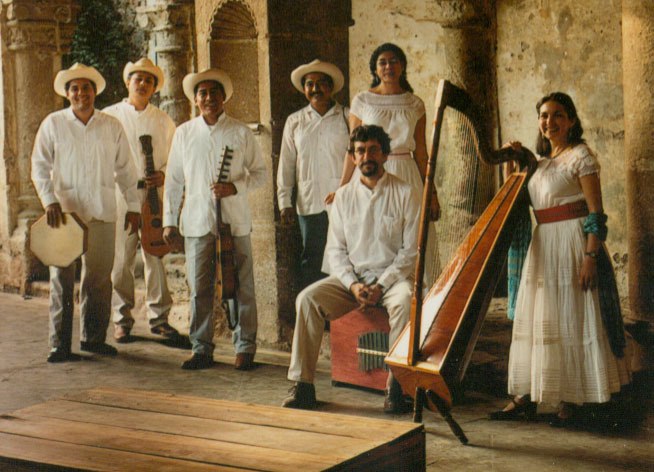 The group employs requintos, jarana, marimba, percussion and voice in their work. Founded in 1990, this group of six musicians from the State of Vera Cruz, Mexico, composes and performs the son and has been performing in shows and giving workshops worldwide ever since. The group has spent a great deal of time researching and reintegrating into the fandango sons their poetry, old and forgotten instruments and dances, especially those with strong African influences. In the US they have recently completed a tour with the support of Arts Midwest. Additionally they have performed at a variety of venues including Lisner Auditorium in Washington, DC, Expo 2000 in Hanover, Germany, and the Festival Cervantino in Guanajuato, Mexico.